Cameron--Thomasen. At St. Peter's Church, Mt. Maunganui, Cecil Lorraine, daughter of Mr and Mrs P. E. Thomasen, 16 Riverton Road, Mt. Maunganui, to Stuart Ross, son of Mr and Mrs R. C. Cameron, "Corrychoillie", Ormond, Gisborne, The attendants were; Robert Cameron, Gisborne, brother of the groom, Lynette Thomasen, and Margaret Thomasen (chief maid), sisters of the bride, and Graham Watton, Paeroa (best man). The pageboys were David Cameron, Auckland, and Stuart Cameron, Opotiki, nephews of the groom. Future home....Mt. Maunganui. Hollinshead--Hughes. At the Methodist Church, Te Awamutu, Thelma, youngest daughter of Mrs M. Hughes, 32 Valley Road, Gisborne, and the late Mr J. E. Hughes, to Kenneth Murray, fourth son of Mr and Mrs A. Hollinshead, Te Rahu Road, Te Awamutu. 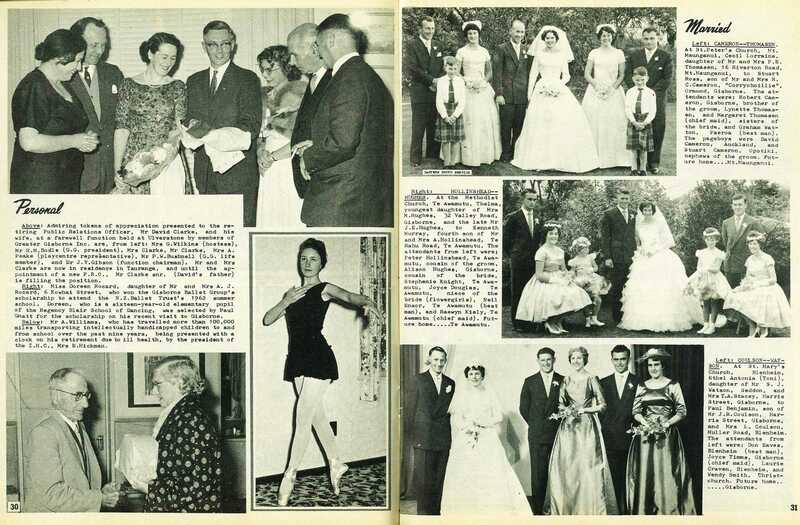 The attendants from left were; Peter Hollinshead, Te Awamutu, cousin of the groom, Alison Hughes, Gisborne, cousin of the bride, Stephenie Knight, Te Awamutu, Joyce Douglas, Te Awamutu, niece of the bride (flowergirls), Neil Ensor, Te Awamutu (best man), and Raewyn Kiely, Te Awamutu (chief maid). Future. home.....Te Awamutu. Coulson--Watson. At St. Mary's Church, Blenheim, Ethel Antonia (Toni), daughter of Mr S. J. Watson, Seddon, and Mrs T. A. Stacey, Harris Street, Gisborne, to Paul Benjamin, son of Mr J. R. Coulson, Harris Street, Gisborne, and Mrs L. Coulson, Muller Road, Blenheim. The attendants from left were; Don Eaves, Blenheim (best man), Joyce Timms, Gisborne (chief maid), Laurie Craven, Blenheim, and Wendy Smith, Christchurch. Future home.......Gisborne.